Flyers range in size from A6 to A4, with the most popular being the DL size that fits neatly into an envelope or mailbox without needing to be folded. Printing options range from black print on white or coloured paper to full colour on front and/or back. Different wieght stock is used to achieve your required result from 80gsm paper up to 300gsm card. Use these flyers as advertising, appointment cards, loyalty cards etc. A4 sizes can be folded down to DL size to create a small booklet. Adding a foil aspect to the print will give an extra impact to your correspondence. Postcards using 300gsm stock give a professional feel to the cards. 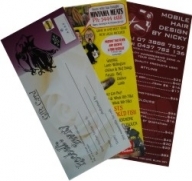 They can bused in place of compliment slips or as invitations, appointment cards or advertising material. Available in full colour front and back with either a gloss or matt cello finish.